and do not have class today. Expect some snow pictures soon! you're so cute in that dress! i love the floral couch! you look adorable and i love the tights. keep warm! Hey, thanks for ur comment. Yeah that couch is amazing, and from a 2nd hand store? I've never thought about searching for furniture in there! By the way, are you back to my beloved London? 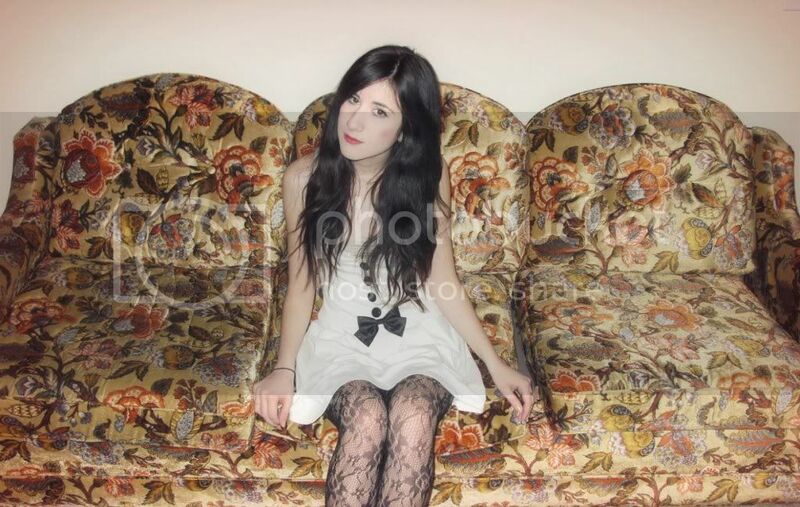 That dress looks adorable and we used to have a couch just like that! You look like a little princess:)Hope your weekend is lovely too! i like this dress! she's so beautiful! the floral couch is so cool! and you look soo cute! oh my god that couch is amazinggggggggggg! my jaw dropped. that couch is amazing. I love your couch so much! If I could have my own apartment ( I'm 13 lol) I would no doubt buy that. The dress is also cute too... looking forward to the snow pictures. Love these two photographs, you are gorgeous! AW! Wow, you look like a tiny, beautiful decoration on that rad couch. Beautiful blog you have. your dress is beautiful. i love your sofa too. You look adorable and that sofa looks soooo comfy!! i love these pictures! that sofa is awesome, and i cannot believe you thrifted that dress! Ah, that dress is such a great secondhand find! Too adorable. I have lace tights similar to yours and I cannot get enough of them. They're so dainty and fun to wear with flats or boots. Your dress is ridiculously adorable. Great dress to celebrate the upcoming Alice and Wonderland movie! soo much in love with these photos. This sofa is amazing ! If you could have a look at my blog, I would really appreciate it. Gorgeous outfit + pictures - i hope you have a lovely weekend! i love your couch! i totally agree on the pastel shades. i neeeed them! i love that couch...definitely something i would have in my apartment. oh I love your outfit and your couch! you get the best stuff fromm thrift stores! i wish we had more here in Portugal. I really like the colors here, and your dress is just lovely. That couch is picture-perfect for an editorial! Oh my dear you look so so sweet :) Love your pose! such pretty tights! love the sofa! ohhh this couch is perfect!!! Your casual dresses are perfect for winter. They're very cute. This one with the bows is beautiful.